Tomatoes! First of the season! I realize I neglected last week’s blog post – whoops! The heat wave had me thinking only about irrigation apparently to the neglect of all other things! The farm has survived the heat, not too worse for wear. It may have negatively affected pollination of some of the fruiting crops (e.g. tomatoes, cucumbers, summer squash…) but we won’t know that for a few weeks. We may have a period in a few weeks when those crops have reduced production. 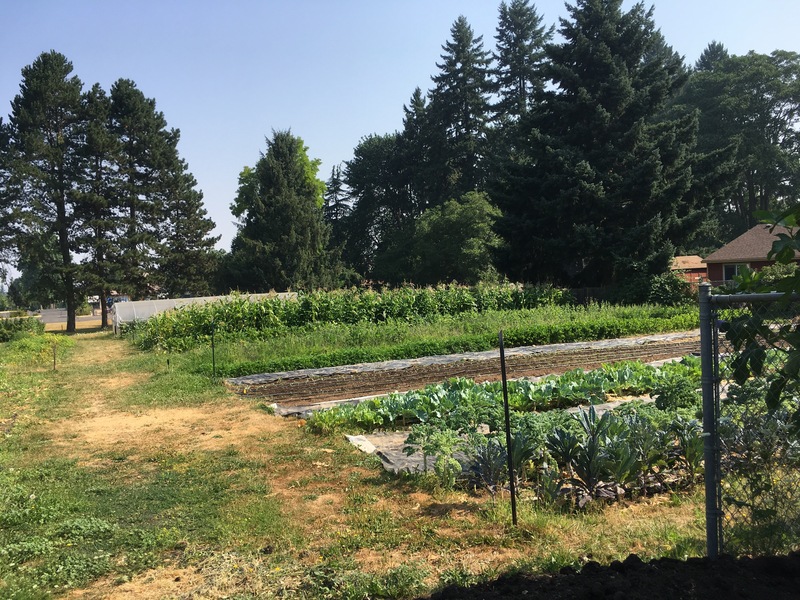 We’re giving out about 2 weeks worth of carrots this week because we had to go through the whole bed to not let the weeds completely take over. They store well in the fridge in a plastic bag. We’ll probably be waiting a few weeks for the next planting of carrots to size up. Yes tomatoes are really here! 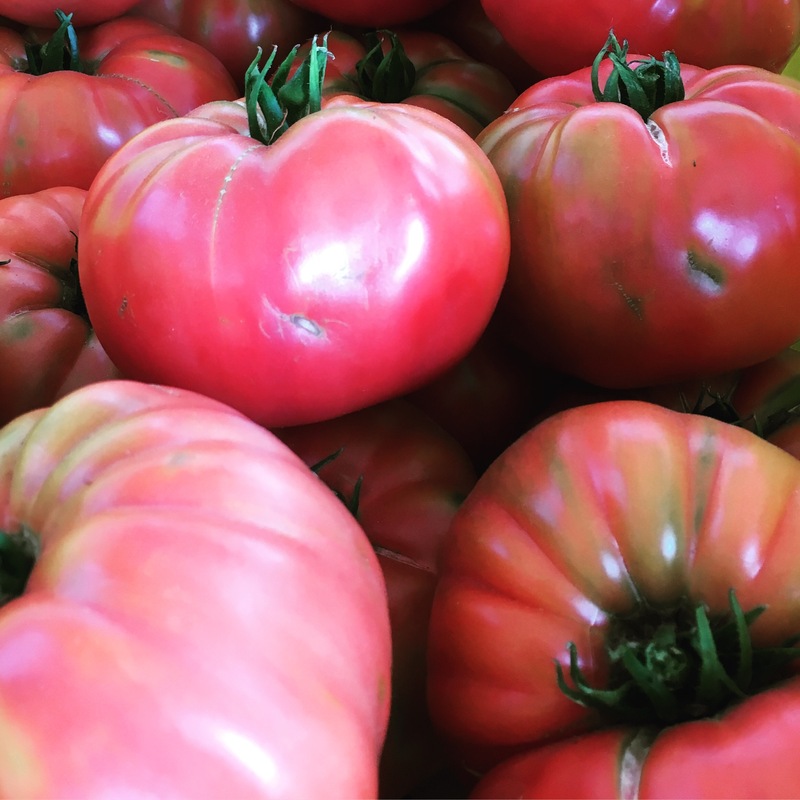 The slicers are called “Matina” and the large pinkish ones are an heirloom called “Pruden’s Purple.” We have U-pick cherry tomatoes available starting now as well, in addition to the cut flowers and herbs. Ask us where to find these items when you pick up. I’ll be leaving paper bags (for cherry tomatoes), clippers, and rubber bands (for u-pick flowers & herbs) next to the sign-in sheet. I’ll also mark the cherry tomato u-pick area with some yellow flags, so you can find them if we’re not there. What else have we been up to? Well, harvesting, washing, and sorting takes up most of our farm days now. We did find a little bit of time to do a few other tasks today though. We are saving seed from a selection of rainbow chard from last year and that seed is pretty mature, so we chopped those plants down and laid them out on some netting to get them out of the irrigation spray. There they’lll dry a bit more before we attempt to clean the seed off the stalks. Then the crew got into some serious carrot weeding. Unfortunately our carrots seem to be planted in a very weedy area this year. It has and continues to be a struggle trying to keep them reasonably unencumbered by crab grass and pigweed. But we made a bit of headway on that today. 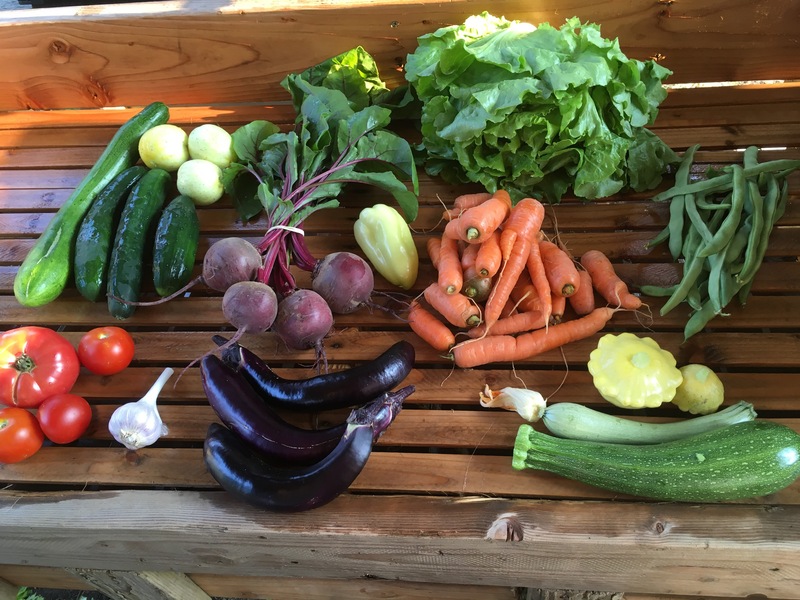 There is always an unending list of to-do’s on the farm, but these bountiful days we keep adding to that list without being able to check many things off except for the most necessary; harvest and distribute produce, and irrigation. OK… A few pictures to end this post. First, a view from the south side that some of you don’t see much because you come to pick up from the north. On the right you can see the kale and collards, which really don’t like this heat. It turns them tough and leathery. We aren’t giving them out these days much because it’s just not their best season. A few beds behind them we’ve planted more kale, collards, cabbage, and kohlrabi for the fall season. They are babies right now, just a few inches tall. 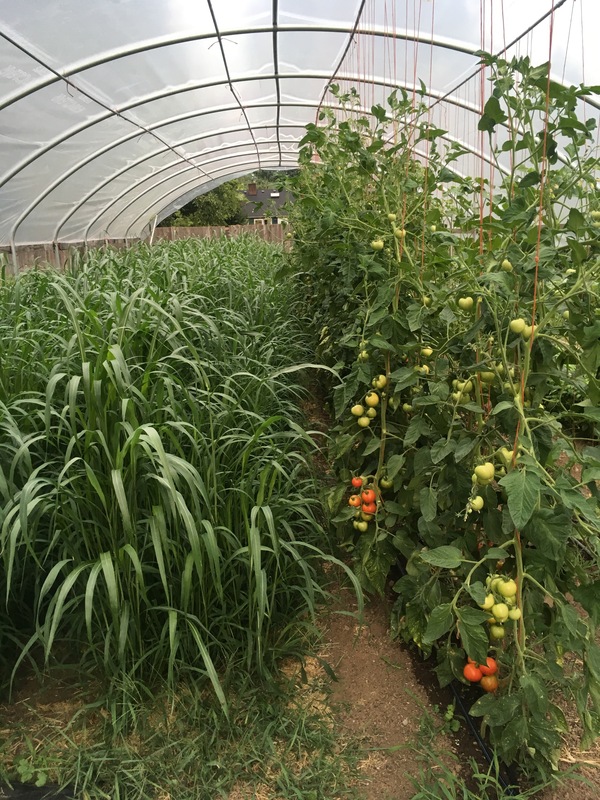 Inside the hoophouse: on the left is a cover crop of sudan grass that is growing between our early spring crops and our late fall crops. We will mow this down any day now, cover it with a tarp and leave it for 3-4 weeks before we prep that area for fall plantings. 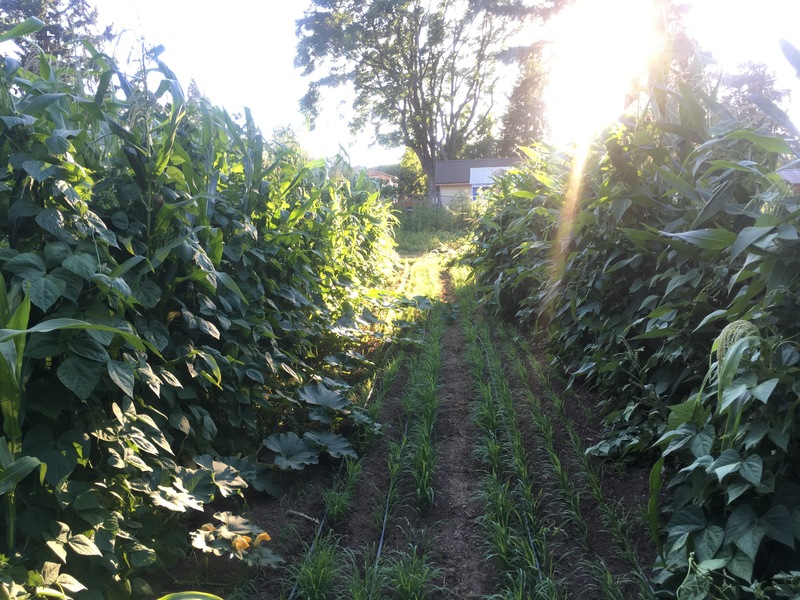 The view from the “3 Sisters” area: Corn, beans, and winter squash are growing together. In the alleyway here you see sudan grass cover crop coming up where the Walla Walla sweet onions used to be. That’s it for now. Have a great week! Note that the Monday 8/21 pickup is being moved to Tuesday 8/22 due to the eclipse.